At G.L. Wilson, comfort is our priority with affordable hot water heater installation offered in Saint Johns and surrounding areas. 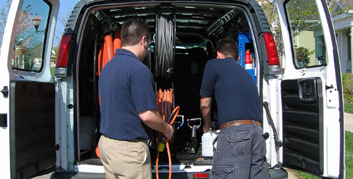 We are a group of highly-trained technicians who have worked with all brands of equipment. With so many years in the industry, we can properly asses your current heating and cooling system to offer the best suggestions for hot water heater installation. With industry-leading technology more advanced than ever, it's the perfect time to install a new AC unit, furnace, boiler, or water heater. A furnace heats your home with air that is distributed to different rooms through the ductwork. Most common in homes or facilities with baseboard heating, boiler systems contain tubing through which water passes to be heated quickly. Water can be boiled which allows steam to heat the facility. These tanks both heat and store water, so it can be drawn out and used when needed. Heat using these systems is usually generated by gas or electricity. We also offer a wide range of electrical services for our Saint Johns area customers, making all of your heating, cooling, and electrical needs only 1 phone call away! We use only the best in your home! G.L. Wilson is partnered with Trane, York, and Armana which gets you the very best pricing when you work with us. No matter what equipment you select, your purchase, and our labor, will be backed by a comprehensive warranty to ensure this investment continues to work for you. We arrive on time, prep our workspace, and make sure to clean thoroughly after any work is done. We'll come to your house, office, or factory to analyze your system and offer efficient upgrade suggestions. We want to prolong the life of your heating system as much as possible, and that's much easier with a reliable, high-efficiency system. Before installing or repairing anything new, we'll make sure you're educated on any high-efficiency options that will cut the costs of your energy bills. Give us a call and watch your utility bills decrease! "Fantastic service! If G.L. Wilson isn't your first pick for repair you are making a HUGE mistake! I had set up four appoints to have diagnostics on our AC. The first company to come out did "an inspection" of our system and determined that we need a whole new system which would have costed us in the thousands. I took the information and waited for the next estimate. The next estimate was from G.L. Wilson. They are wonderful! What they did as fixes were so simple, cost-effective, and right that we didn't need to look anywhere else! Instead of thousands of dollars, it costed us under $300! Wonderful people, wonderful service!" Patricia P.
If you want your hot water heater installation done right, call G.L. Wilson to request an estimate today!